Goh and a staff member from Saradise Gallery with ‘The First Eucharist’ – Goh’s interpretation and reproduction of Leonardo da Vinci’s masterpiece ‘The Last Supper’. 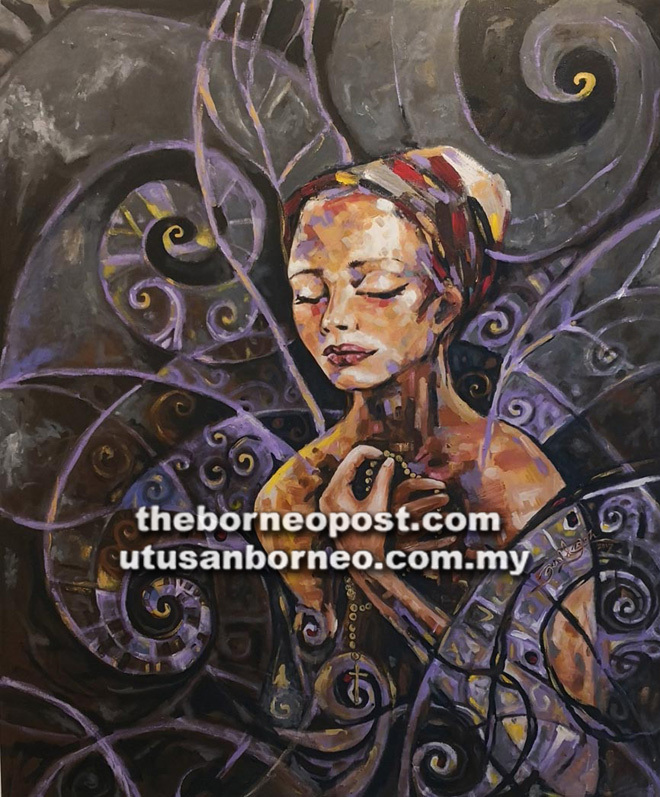 SARAWAK is awash with talent in creative arts – from painting, handicrafts, poetry, writing, photography, architecture, sculpture, and structure, to the many forms of performing arts. While this reflects the uniqueness of our artistically and culturally diverse society, the majority of locals, however, have yet to warm to art appreciation. This reality is not lost on local artist Gerald Goh. 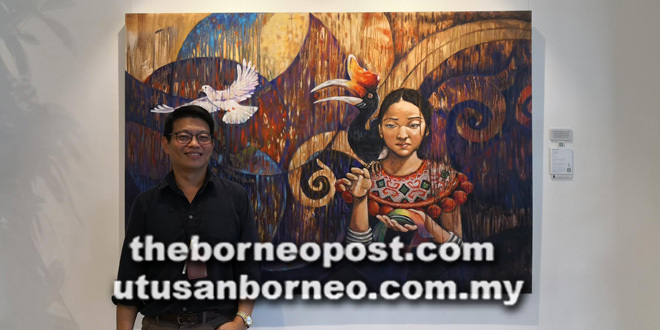 He has stressed the need to foster greater appreciation of art in Kuching and will continue to contribute towards the development of art in Sarawak. A third-generation potter, his life has revolved around art since childhood, starting with making pottery at his family’s factory and workshop before moving into painting on ceramics – and now on canvas. ‘The Voyage’ also featured photographs Goh took during his travels. Today, he is sole proprietor and chief curator of an event company, as well as Sarawak Handicraft, Arts, and Souvenir Association president and Sarawak Artists Society vice-president. 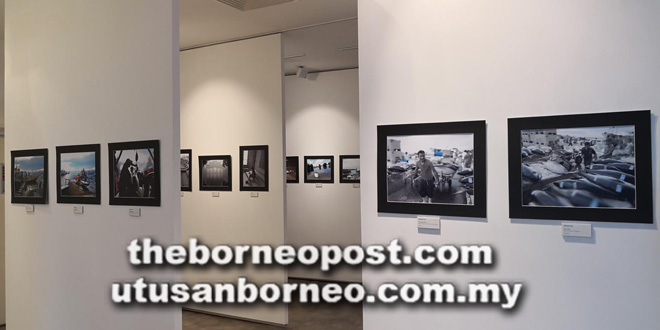 Having spent many decades working in the arts, event, and tourism industry, Goh finally put on his very first solo exhibition, themed ‘The Voyage’, at the Saradise Gallery in Brighton Square, Kuching, recently to share the twists and turns of his life’s journey – but, nonetheless still an incredible journey, as he put it. The collection of acrylic and oil paintings as well as sculptures and photography at the exhibition communicated and expressed his discovery, confusion, pain, sadness, hope, coping, acceptance, and healing. “At first, I never thought about doing this and becoming a serious artist. But my wife passed away about a year ago due to cancer and I found solace in painting,” he told thesundaypost. ‘The Vanishing World’ is one of Goh’s early artworks when he started experimenting with oil in the 1980s. Art has grounded and helped him navigate through the confusion and harsh world, and every stroke gave him the peace and strength to come to terms with the finality of loss as well as to persevere and move forward. “I even took a trip to France and Paris. It enabled to look back and recall how I started as an artist. Artists normally start by copying the works of others to brush up their skills. And where becoming an artist is concerned, the trip was an eye-opener for me,” he said. Oscar-Claude Monet (France), Leonardo da Vinci (Italy), and Vincent van Gogh (Holland) are among the immortals of the art world whose works Goh studied and copied. These all-time greats have influenced and inspired the development of his own artistic style and prowess. “I never thought one day I would have the chance to go to the pond and paint like Monet … in front of the green lovers’ bridge. It was a really a dream come true,” he recalled fondly. After a life-changing episode of transformation and growth, Goh feels it is time to promote art and the appreciation of art in Sarawak. “One of the things I want to do through this exhibition is to use the proceeds to help charitable bodies, and more importantly, to preserve the techniques and skills of various arts, including through documentation, so the knowledge can be passed down,” he said. ‘Before The Tie’ is about the Iban community, well-known for well-documented and preserved authentic traditional cultural practices. According to Goh, art plays a pertinent role in the development of an economy or a society and the discourse of social, cultural, and global concerns. “It influences society by changing opinions, instilling values and translating experiences across space and time, which is important to a developing economy. “Research has shown art affects the fundamental sense of self and propels change in the thinking of a person – like how a song, film or novel can arouse emotions in those who encounter it, inspiring them to rally for change which they now see through the encounter with art,” he explained. Painting, sculpture, music, literature and the other arts, he pointed out, were often considered as the archive of a society’s collective memory. 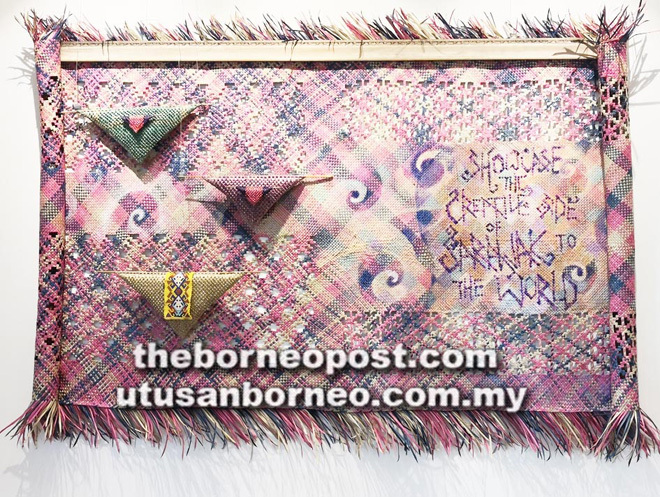 This handwoven collage was created through a traditional tapestry weaving method unique to Sarawak. He said to express inner feelings through subject matters, colours and textures, artists have the unique ability to engage individuals in a very deep and personal way. “Art can help us understand our humanity and the historical conditions we live in, but more importantly, it can draw us into thinking whether our realities need to be changed. This piece has been sold and part of the proceeds will be donated the National Cancer Society Sarawak. Goh noted that works of art may also have a much-intended purpose to communicate ideas politically, spiritually or philosophically, creating a sense of beauty and pleasure, exploring the nature of perception or generating strong emotions. ‘The Prayer’ – a painting Goh dedicated to his late wife. Among his collection is a hand-woven piece of collage art or tikar bergerang created through a traditional method of tapestry weaving unique to Sarawak. It was woven for Saradise Gallery by Ngot Bi or Nek Ngot, 86, who was awarded the Seal of Excellence for Products of Southeast Asia from Unesco in 2005. Traditionally these woven bergerang mats were made for a variety of uses such as prayer mats, to welcome the birth of the first born, for the groom to sit on during a marriage ceremony, or as floor coverings during special occasions. The mat incorporates a surrounding open weave, which creates a lace-like impression pattern around the tapestry. This particular unique hand-made piece entitled ‘Solidarity’ reflects the unity and solidarity of the diverse cultural identities through an ethnic tapestry. Goh said art appreciation in Sarawak is still in its infancy and called for greater efforts from all sectors to take it to the next level. Goh stands next to his painting ‘Risen Peace’, which tells a story about adversity, accepting the truth, picking up the pieces and embracing peace when precious endowment is lost. 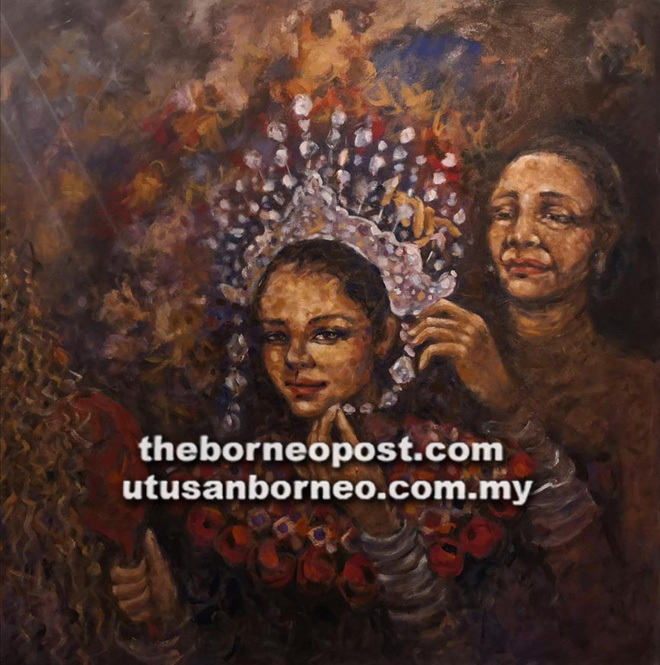 He said Sarawak is blessed with rich cultures, which are perfect for developing the art scene, adding that these, in turn, could serve as a resource-rich reservoir for the development of other industries. “In a developing society and economy, the authorities would have to base their planning on a genuinely holistic understanding of development. This may involve giving as much attention to the development of its arts and cultures as to that of its economy, politics and technology,” he suggested. 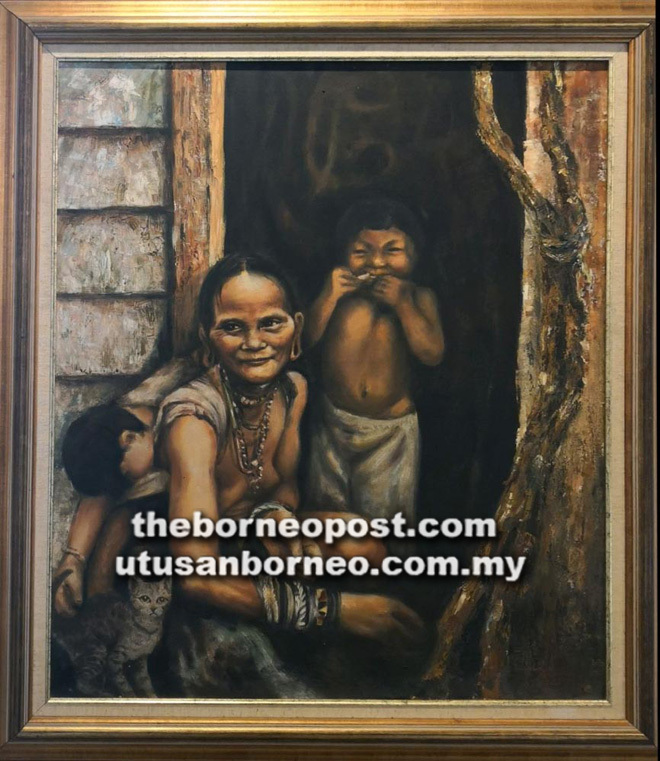 With his involvement in arts-related organisations, Goh proposed that the idea of setting up of the Sarawak Art Gallery be holistically explored to generate greater interest in art. “If we look at Malaysia as a whole, Sarawak is the most creative – hence the need for a platform for our artists to showcase works and be in the public eye. Goh emphasised that the art ecosystem in Sarawak needs to be elevated to a level where art will be seen as an investment, not just an object of decoration. “To achieve this, we, as a fraternity of artistically inclined enthusiasts, will be proud to contribute in whatever way we can to the development of art in the state,” he said.